Home Trainers	Nike Air Trainer SC High: Strength & Conditioning in camo. Yeah, we were late with these, but we love the Nike Air Trainer SC and wanted to rant about them a bit, because we feel the UK gets a little short-changed on them. You really don’t have to care for baseball, football or any of the other sports Bo Jackson was good at (and if you watched the excellent Bo ESPN documentary late last year, you’ll know that the face of Nike’s Training division didn’t actually need to train very much) to appreciate this shoe, because that shape, toe down view and silhouette makes it another kind of cross trainer— a trainer that can span shorts and denim with ease. That use of sailcloth fabric and the use of colour on the originals? Perfect. Then all the numbering and naming got mixed up in the years that followed as certain installments made reappearances (and at the end of the 1990s we got super confused by the reissues, because SC for strength and conditioning and sport classic seemed to collide). We liked the 1999 Lemons (which were also retroed a couple of years back) alongside some other colours that were made of great materials, but the Orange Crush/Concord reissues of 2009 split opinions because that leather just wasn’t up to scratch. 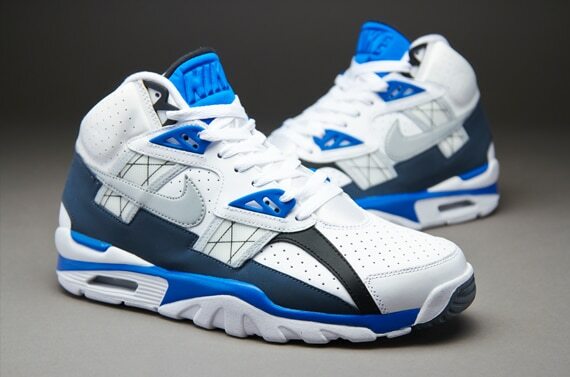 The Nike Air Trainer (which we also remember as the Air Trainer SC III High) SC deserved something better. We’re not sure whether we haven’t been paying enough attention to our order book or whether someone else took them as an exclusive, but are we being denied the Orange Crush colourway because the last release underperformed on these shores? And why did we never get Raiders colourway and the Nike Air Trainer SC II Quickstrike editions that were excellent and not made of some nasty pleather? Did the Chlorophyll Air Trainer 1 reissue pass us by too? There’s a lot of mystery surrounding how this shoe is treated over here. What we do get is shoes like this Super Bowl Vince Lombardi Trophy themed colourway, with some silverware themed panels and camo on the outsole and lining. A subtler use of silver and no camouflage would have made these feel like an unreleased 1999 sample, but they go all out and end up a little busy as a result. Still, if you’re after some field warfare themed shoes, these fit the bill and they’re in the store now. We prefer this shoe in a simpler form and in an ideal world, kids would be going as wild-eyed for Bo-endorsed bangers as they are for MJ’s output.